Honoring the best photographer, filmmakers, and athletes, the biggest night in skiing only comes once a year. 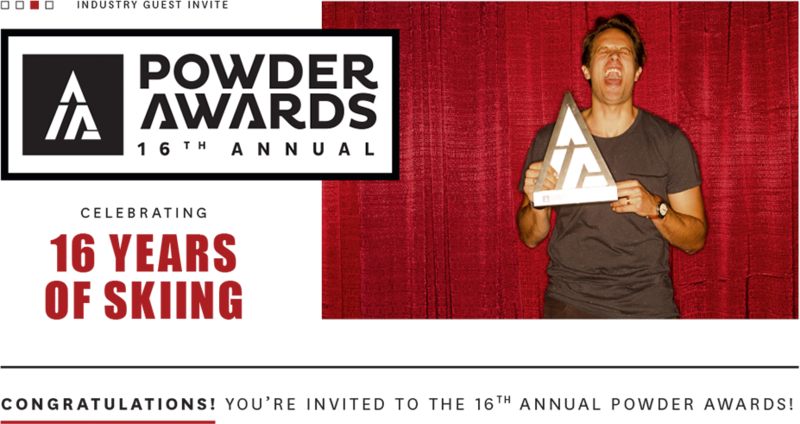 The 16th Annual Powder Awards is Friday, December 4th at The Depot in Salt Lake City, Utah. Time to pull out your best cocktail attire, shave the mustache, grab your friends, and join us on the red carpet. Then recover with us at the 3rd annual Late Morning After on Saturday at Alta, with skiing, brews, and maybe even a few movies. Join us up at Alta Ski Area for the Morning After and a day of skiing by getting your Powder Awards invite and a discounted Alta lift ticket.